It makes it possible to reduce latency while running Pd by harnessing the real-time capabilities of the operating system. 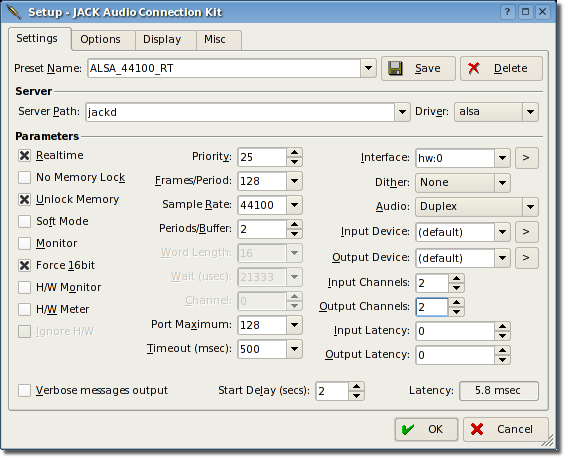 JACK is just as essential to my setup that my low-latency OS (currently Ubuntu 10.04). 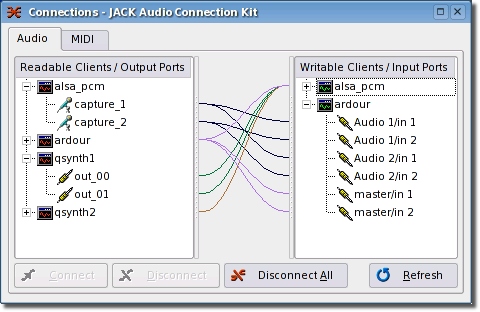 The user can also control the connections between different audio applications. This can get crazy (JACK is really a very powerful piece of software), though I have never connected more that two apps. Installing JACK was pretty easy on most Linux distros i’ve tried, though it sometimes required editing a configuration file and adding myself to some groups. I suggest reading the FAQ and the numerous tutorials available on the internet (try this if you’re using Ubuntu). This entry was posted in JACK and tagged audio, guitar, jack, linux, pure data. Bookmark the permalink. Periods/Buffer (why 2 instead of 3)? I’ve never changed the default settings (Force 16 bits, Unlock memory, Priority). I only change the sample rate to match that of my soundcard, and i try different values for Frames/period and Buffer/period until I get the lowest latency that doesn’t give me X-runs. The picture doesn’t reflect my own settings.